A British man has left hospital just four days after major heart surgery - performed on him by a robot. Retired physicist John Cast, 72, is one of the first people in the UK to undergo the procedure, called totally endoscopic robotic coronary artery bypass (TECAB). Normally, a heart bypass requires surgeons to crack the rib cage open so they can gain access. But in Mr Cast's case the only incisions needed were four holes the width of pencils. The procedure is controlled by a surgeon, but instead of operating directly on the patient, he uses an instrument console several feet away. This allows him to orchestrate the highly precise movements of a pair of robotic arms. These arms are designed to mimic the dexterity of a surgeon's forearm and wrist - but in fact they actually have a greater range of motion, and are less susceptible to tremours, allowing surgeons a finer degree of precision than ever before. 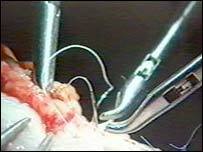 By watching a monitor linked to a miniature camera, the surgeon is able to manipulate the arms even when they are inside the chest, and out of sight. Mr Cast's surgery, which took place at St Mary's Hospital, Paddington, London, was performed by consultant cardiothoracic surgeon Roberto Casula. As in traditional surgery, a healthy blood vessel was removed and used to bypass a blocked artery to the heart. Mr Casula said: "TECAB surgery is unique because, unlike a traditional bypass operation, there is no need to open up the chest. "This provides a huge number of benefits for the patient including just a small amount of scarring, less pain (and use of pain killers), a reduced chance of post-operative infection and blood transfusion, and importantly, quicker mobilisation speeding along a good physical and emotional recovery." At present, the technique can only be used on patients requiring a single vessel bypass, but it is hoped that in future it can also be used to perform double and triple bypasses. Mr Casula said: "We are continually fine-tuning the work we do, but I've no doubt that what we have achieved will make a serious impact on the future of bypass surgery." Speaking at his home in St Albans, Hertfordshire, a month after the operation, Mr Cast said: "I can't believe how quick my recovery has been and how much better I feel already. Mr Cast said: "I feel very lucky that I've had this procedure. I thought I was having a traditional bypass until I received a call asking me to come to St Mary's to see if I was suitable." Each year, more than 25,000 people in the UK require bypass to restore blood flow to the heart. The system has already proved a success in other European centres and the United States.